It's one of the most hotly-anticipated movies of all time. After it was announced Hollywood would be remaking the original Swedish adaptation of Stieg Larsson's famous novel The Girl With The Dragon Tattoo, the question on everybody's lips was who would be playing lead character Mikael Blomkvist. 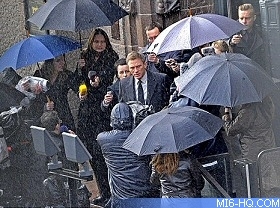 And now James Bond star Daniel Craig has started shooting the blockbuster on the streets of Stockholm, Sweden. 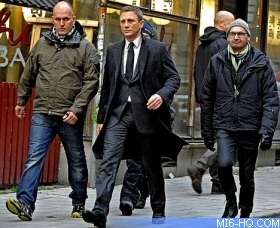 The 42-year-old actor was spotted shooting one of the opening scenes of the novel on the steps of a courthouse in Stockholm yesterday. 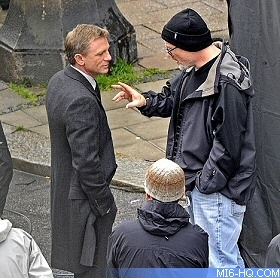 Craig was also seen chatting to director David Fincher before another scene shot later in the day. There was no sign of Craig's co-star Rooney Mara, who will be playing the title character Lisbeth Salander, on set, although she was pictured arriving in Sweden earlier this week before starting training for one of the film's many motorcycle scenes. The Girl With The Dragon Tattoo is the first book in Larsson's trilogy and tells the story of journalist Blomkvist, who teams up with computer hacker Salander to attempt to solve the disappearance of a young girl called Harriet Vanger. And while the Hollywood version of the film is sure to be a hit, director Fincher insists he isn't trying to remake Niels Arden Oplev's Swedish film. He said in a recent interview: 'There is absolutely no reason to do such a thing. Steve Zaillian has written the new screenplay and he based it on the book and made his own version. Meanwhile, Fincher also confirmed that British actress Joely Richardson would be joining the cast, although he did not reveal which character she will be playing. Steven Berkoff has also signed on to the film, and is believed to be playing Lisbeth's villainous conservator Nils Bjurman. The movie is expected to be released in late 2011.